The below business priority weights define how the enterprise will focus energies and apply resources to succeed. From here IT leadership can develop its own supporting strategy with greater confidence that it delivers maximum value and aligns with business needs. We will address how these weights are developed later. How the CIO becomes the IT Strategy Facilitator. A common struggle with strategy development is ‘paralysis of analysis.’ Organizations and leaders often feel compelled to develop and articulate the plan in order of importance. Don’t let this happen! As with many types of facilitated exercises, throw IT objectives and metrics against the wall and ask a direct question: “Will doing this well enable and drive success among one or more of the business objectives and priorities?” If the answer is yes, leave it up there. The question of importance comes later. When articulating strategic priorities, or Value Measures in ValuNav terms, focus on outcome-based definitions. 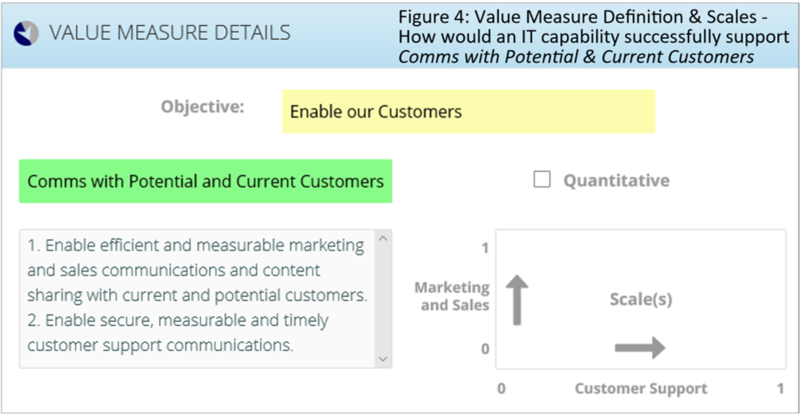 Force yourself to define what your organization will measure to evaluate performance. Will a priority’s scale be quantitative such that stakeholders can easily agree on how a project or investment alternative performs? Or, might the scale be something qualitative and require collaborative input on how well alternatives perform? Push to get this IT Strategy Map both well defined and supportive of the entire business strategy. This strategy map will be a living roadmap as an organization evolves, driving budgeting allocation and resource application decisions. Promote unbiased and transparent stakeholder input. Reviewing our steps so far, we have 1) reviewed our organization’s strategic priorities and 2) defined a supporting IT Strategic Plan which includes objectives and success-driving value measures. The third phase of our process is to rank, scale, or otherwise weight our IT priorities so we can begin to understand the greatest demands of our time, focus and resources. This phase of strategic governance can prove difficult in the absence of either a formal IT Governance and decision making process, the existing process is misaligned to the management and operations structure or it lacks clear and concise priority weighting methodologies. 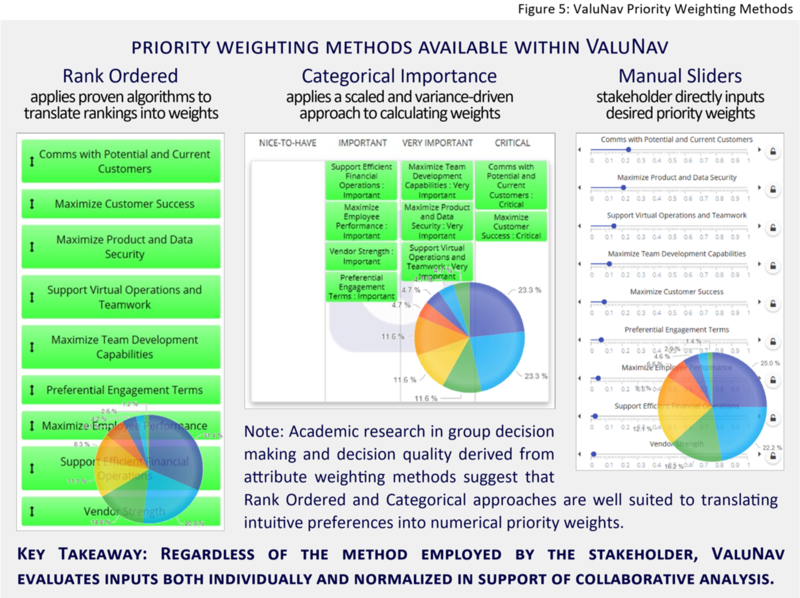 The governance process of applying weights to strategic priorities is critical in transforming the flat strategy map into a multi-dimensioned form that can provide actionable guidance. What follows are a few intuitive, quick and sound methods to allow your governance stakeholders to properly and collaboratively provide their input on the weights of your strategic priorities. An analytical and federated approach to IT Governance. A common IT Governance weakness in organizations is limited representation in the decision making process. A ‘business monarchy’ model only includes the C-Level executives, while an ‘IT monarchy’ keeps the reigns entirely within IT leadership. One of the worst models, ‘feudal,’ involves only business unit leaders. Each of these fails to include representation of sufficient strategic leadership and operational management. The ‘federal’ approach receives input from C-Level executives, IT and business unit leaders. A collaborative and transparent ‘federal’ approach provides a solution to these ‘Strategic IT Priorities Governance’ challenges. Employing the collaborative ‘federal’ approach, we can distribute our IT Strategic Priorities model to stakeholders remotely, allowing each to apply their own analysis, experience and intuition and input priority weightings using which ever method they choose. 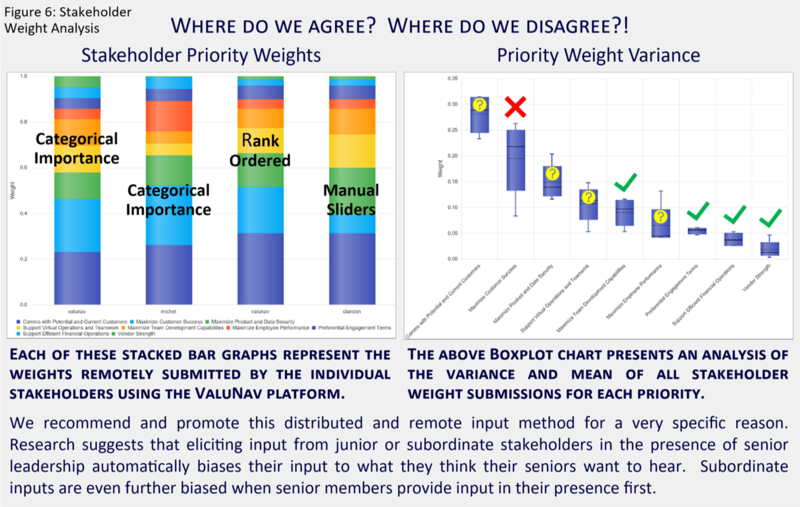 The good news from our weighting inputs is that we have some strong agreement on the lower end of our priorities. However, we do have some disagreement in the upper half. This is not a bad thing. This input, and subsequent analysis, allows us to focus our conversations on why stakeholders feel this way, and allowing them to support their input. The IT strategy, and its execution, is undeniably critical in business today. Nearly every aspect of our operations rely either wholly or partially on the support of an underlying IT product, service or safeguard. Therefore, getting it right is also undeniably critical. The prioritization of strategic objectives and measures will drive IT budgeting and investment decisions that effect success. We will touch on these in parts 2 & 3 of this CIO Challenge Series. Collaborative Strategic IT Governance is not about achieving consensus! A collaborative governance process seeks to provide clarity and transparency among the decision-making team and promote unity of effort in the downstream strategy execution.